嵐 (romaji: arashi; definition: storm) is a jpop group composed of five male members: Ohno Satoshi, Ninomiya Kazunari, Sho Sakurai, Aiba Masaki and, of course, Matsumoto Jun. It was formed by Johnny's Entertainment back in 1999 and like what their name means, they took Japan by storm. 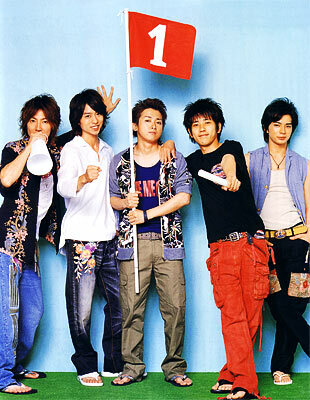 Their first single, A-RA-SHI went to #1 in the Oricon Charts and is their best selling single to date. Their music ranges from pop to hip-hop and rap to ballad and even rock. But aside from singing, the group also does acting and hosting both as a group and individually.